Lymphoproliferative diseases and their classification have been one of the most fascinating and difficult topics studied in human medicine since the beginning of the 20th century. In the last decade attention has been focused on identifying similar diseases in veterinary patients and recently flow cytometry has become one of the best techniques to use in this field. Most attention has been given to the study of canine lymphoma, and there is little information available about lymphoproliferative diseases in other species, especially in the cat. This short article will give a brief introduction on feline lymphoproliferative diseases updated to the most recent papers published in the literature. Lymphoma accounts for nearly one third of all cancers in cats with a prevalence that is higher than in all other species (1, 2). The traditional anatomical classification recognizes several forms which are distinguished according to the localization of the primary lesion. The gastrointestinal form is at the moment considered the most common one, followed by the extranodal (renal, nasal, and cutaneous), multicentric and mediastinal forms (3). Many studies have been done in order to obtain more information on the occurrence of feline lymphoma and several factors are reported to be involved in the pathogenesis. According to the etiology, feline lymphoma can be divided into 2 main categories: retrovirus-associated lymphomas and non retrovirus-associated lymphomas. FeLV (Feline Leukemia Virus) and FIV (Feline Immunodeficiency Virus) are the main viruses involved in the pathogenesis of lymphoma. FeLV has been demonstrated to be directly correlated to the development of lymphoma (mainly mediastinal forms) through an acquired insertional mutagenesis in which the integrated provirus may activate a proto-oncogene or disrupt a tumor suppressor gene (4). On the other hand, the role of FIV in the development of lymphoma has not been completely clarified although the majority of published studies addressing this issue suggest oncogenesis arises via indirect mechanisms (5). The underlying causes of non–retroviral-induced feline lymphomas are not completely understood. Several factors have been considered to be related to the onset of lymphoma; previous chronic inflammation (e.g. IBD) and genetic. Interestingly, several studies have shown that the incidence of feline lymphoma has risen in the last decades with a change of incidence of the different forms. Before control of FeLV by serology testing and vaccination in the early 1980s, more than 70% of all cats with lymphoma were FeLV positive and had mediastinal lymphoma. After that, a decrease in these forms and an increase in the non-retroviral associated lymphomas have been noted. At the present time, the types of lymphoma that are more commonly observed in the feline species are the alimentary (mainly intestinal) and the extra nodal forms, mainly renal and nasal (3). Several systems have been proposed in the last decades to classify lymphoproliferative diseases in both humans and domestic animals. These efforts ended with the creation of the Revised European-American Lymphoma (REAL) classification, adopted in 2002 by the World Health Organization (WHO) and then adapted for domestic animals. This classification is considered to have a significant prognostic value. According to this, one of the main criteria for correctly classifying these neoplasia is the determination of the immunophenotype. This can be achieved by several techniques such as immunocytochemistry, immunohistochemistry, and flow cytometry. Each one of these techniques has advantages and disadvantages but the combination of cytology and flow cytometry is likely to achieve the highest sensitivity and specificity in the diagnosis of lymphoma. The main advantages of the flow cytometry technique compared with immunohistochemistry include: the possibility to use a wider panel of antibodies (still more limited than in the dog), quick results (a few hours compared with several days for immunohistochemistry), non-invasive techniques (it can be performed from a fine needle aspirate with no need for a solid tissue biopsy). However, the main disadvantage of flow cytometry compared with immunohistochemistry is the inability to evaluate the architecture of the tissue, which might be important in some forms of lymphoma (nodular lymphoma, T-cell rich large B-cell lymphoma). The panel of antibodies, available for the cat is more limited than that for the dog and may differ from one laboratory to another. Bio-Rad provides a significant number of feline antibodies, some of which are monoclonal antibodies specifically produced to react with feline lymphoid antigens (CD4, CD5, CD8) and some others monoclonal or polyclonal antibodies, which have been reported to cross-react in the feline species (CD14, CD21). Unfortunately, some of the most common and useful antibodies used in dogs (CD3, CD34) don’t cross react in the cat. For this reason several studies are going on in order to identify specific monoclonal antibodies targeted to cat antigens. The prognostic value of immunophenotyping in feline lymphoma is still controversial and in the literature there is no univocal consensus about this. A few studies have been performed in order to prove that a T-cell phenotype is a negative prognostic factor in lymphoma (as reported in multicentric lymphoma in dogs) but no clear results have been obtained (6). The aim in veterinary medicine is to reach results similar to those in human medicine where each form of lymphoma (with a different phenotype) is treated with a different and specific chemotherapeutic protocol. In my opinion, more effort should be made to investigate this in veterinary medicine and flow cytometry is the best way to do it. Moreover, flow cytometry plays a very important role in the distinction between reactive and neoplastic conditions. Reactive lymphoid hyperplasia is a condition that frequently affects lymph nodes in cats; it may be due to infectious or non infectious conditions and sometimes it can be difficult to distinguish from lymphoma, since it may have a similar clinical presentation (localized/generalized lymphadenopathy). In this case the identification by flow cytometry of a monomorphic population of cells with the same phenotype (similar expression of CDs) is helpful in diagnosing lymphoma and differentiating it from a reactive condition, where a mixed population of T and B lymphocytes would be expected. Leukemia is a rare condition in cats and retroviral infections (FeLV, FIV) might play a role in the pathogenesis of the disease. Few cases of acute (ALL) and chronic (CLL) leukemia have been reported in the literature (7). The distinction between acute and chronic leukemia can be achieved by cytology and flow cytometry and has primary clinical relevance because chronic leukemias are associated with a better prognosis and median survival times greater than one year. Unfortunately, there is no specific or cross-reacting antibody for feline CD34, the main marker of acute leukemia, although the cytological features of the cells (large size with coarse granular chromatin and prominent nucleoli) and the immunophenotype (e.g. no expression of T and B-cell markers) can still help in the diagnosis. The prognostic value of the immunophenotype (T or B) in feline leukemias has not been investigated yet. Myeloid leukemias have also been rarely described in the cat, with the acute myelomonocytic leukemia (AML-M4) and erythroleukemias (AML-M6) reported to be the most common forms (8, 9, 10). A limited panel of antibodies is available for the evaluation of these rare neoplasms in the cat. The morphological features of the cells in association with the negativity to lymphoid markers and the positivity to CD14 (monocyte/macrophage marker) are useful to confirm the myeloid origin of the cell population. 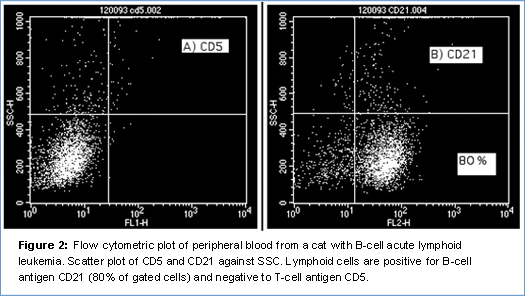 In conclusion, despite the limited panel of antibodies available at the moment and the small amounts of information about feline lymphoma/leukemia (compared with other species), flow cytometry is an important diagnostic tool that in association with cytology (and sometimes histology and immunohistochemistry) is essential for the correct identification and classification of feline lymphoproliferative diseases. (1) Dorn CR. The epidemiology of cancer in animals. (2) Jackson M, et al. Immunohistochemical identification of B and T lymphocytes in formalin-fixed, paraffin-embedded feline lymphosarcomas: relation to feline leukemia virus status, tumor site, and patient age. (3) Louwerens M, et al. Feline lymphoma in the post-feline leukemia virus era. (4) Fujino Y, et al. Molecular pathogenesis of feline leukemia virus-induced malignancies: insertional mutagenesis. (5) Magden E, et al. 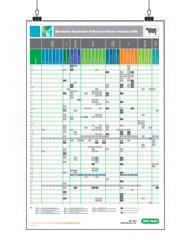 FIV associated neoplasms-a mini-review. (6) Patterson-Kane JC, et al. The possible prognostic significance of immunophenotype in feline alimentary lymphoma: a pilot study. (7) Helfand SC, et al. General features of leukemia and lymphoma. In: Weiss DJ, Wardrop KJ,eds. Schalm’s Veterinary Hematology. 6th ed. Ames, IA: Wiley-Blackwell; 2010:455-466. 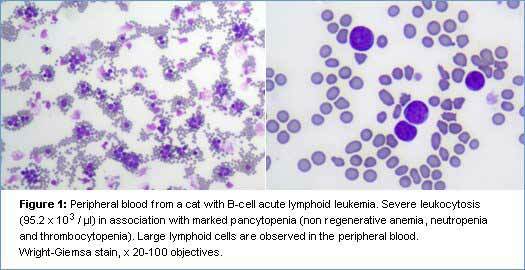 (8) Blue JT, Myelofibrosis in cats with myelodysplastic syndrome and acute myelogenous leukemia. (9) Comazzi S, et al. Erythremic myelosis (AML6er) in a cat. (10) Fischer C, et al. Erythroleukemia in a retrovirus-negative cat.